Cheikh Lô is one of the great mavericks of African music. A superb singer and songwriter as well as a distinctive guitarist, percussionist and drummer, he has personalised and distilled a variety of influences from West and Central Africa, to create a style that is uniquely his own. Lô dedicates both his life and music to Baye Fall, a specifically Senegalese form of Islam. It’s a part of the larger Islamic brotherhood of Mouridism which was established by Bamba (Cheikh Ahmadou Bamba M’Becke) at the end of the 19th century. Bamba’s closest disciple Cheikh Ibra Fall established the Baye Fall movement. 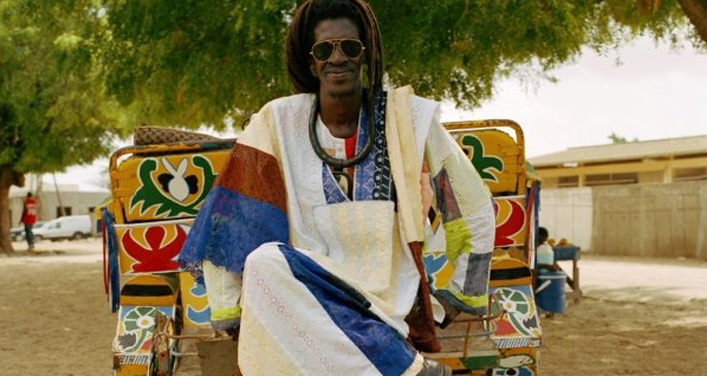 He was the first to wear the Baye Fall trademarks : the patchwork clothes and long dreadlocks. Cheikh Lô was born in 1955, to Senegalese parents in Bobo Dioulasso, Burkina Faso, not far from the border with Mali, where he grew up speaking Bambara (language of Mali), Wolof (language of Senegal) and French. His father was from a long line of marabouts. From an early age Lô was only interested in music, running away from school to teach himself guitar and percussion on borrowed instruments. During his teens he listened to all kinds of music, especially the Congolese Rumba and Cuban music which was popular throughout Africa at this time. At 21 he started singing and playing percussion with Orchestra Volta Jazz in Bobo Dioulasso. The band played a variety of music from Burkina Faso and its neighbouring countries as well Cuban and other styles. In 1984 he moved to Paris and worked as a studio session drummer. He recalls: “Studio – sleep – studio for two years. I absorbed a lot of Congolese and Cameroonian music during this period”. That’s only when he returned to Senegal that he concentrated on his own music. Cheikh’s first cassette ‘Doxandeme’ (‘Immigrants’), on which he sang about the experience of being Senegalese abroad, came out in 1990. Despite his reservations about the quality of the local production, it sold well and earned him the ‘Nouveau Talent’ award in Dakar. The following year he started to work on the compositions for his album ‘Ne La Thiass’. Youssou N’Dour first encountered Lô as a session singer in 1989. “Whenever he sang the choruses I was overwhelmed by his voice,” explains N’Dour “but I really got to know him from his cassette ‘Doxandeme’. I heard his voice and said “wow” – I found something in his voice that’s like a voyage through Burkina, Niger, Mali”. Lô continued to develop his own repertoire, holding out for the best recording conditions for his next production. On hearing Lô’s new songs N’Dour immediately agreed to produce and in August 1995 they went to work in Youssou’s Xippi Studio in Dakar on the album ‘Ne La Thiass’. The album sees Lô joined on vocals by Youssou N’Dour (‘Guiss Guiss’ and ‘Set’) and by musicians from N’Dour’s Super Etoile de Dakar. Lô’s signature sound – a semi acoustic, Spanish-tinged take on the popular mbalax style – was an instant success in Senegal gaining him a dedicated local following. ‘Set’ – a plea to clean up the streets during a Dakar municipal strike, was broadcast on loudspeakers throughout the country in a campaign by the Ministry of Health. ‘Ne La Thiass’ was released internationally on World Circuit in 1996 followed by his debut tour in Europe with his own band. His early performances prompted rave reviews – ‘A rare talent destined to become one of world music’s biggest stars’, The Times – ‘a compelling performer with energy and personality to match that of the early Bob Marley’, The Guardian. In 1997 he was awarded Best Newcomer at the Kora All-African Awards in South Africa and the following year he toured the US, as part of the ‘Africa-Fête’ line-up that included Salif Keita and Papa Wemba. In 1999 he received the prestigious ‘Ordre National de Merite de Léon’ from the President of Senegal. Cheikh’s second album ‘Bambay Gueej’ (World Circuit) was released in 1999. It was co-produced by Nick Gold and Youssou N’Dour in Dakar with additional recording in Havana and London. Expanding on his previous album, he drew on sounds from Burkina Faso, Mali (with guest Oumou Sangare), and incorporated touches of Cuban son (with Richard Egues on flute) and funk (with Pee Wee Ellis of James Brown fame on sax). Following the album’s release he continued to tour successfully and to gather and refine songs for his next recording. His eclectic mix was furthered on ‘Lamp Fall’ (World Circuit 2005) by his discovery of Brazilian sounds and rhythms and he travelled to Bahia, Brazil to work with acclaimed producer Alê Siqueira (Tribalistas, Omara Portuondo). These Brazilian recordings were coupled on the album with sessions recorded in Dakar and London. For the next few years Lô withdrew from the international stage and immersed himself in the Dakar scene playing regularly with his own band and this return home is reflected in his new album ‘Jamm’. His signature blend of semi-acoustic flavours – West and Central African, Cuban, flamenco – has been distilled into his most mature, focused, yet diverse statement to date. Cheikh Lô is an artist unlike any other in music. It’s not just his unique appearance – with long dreadlocks and his colourful patchwork clothes – that sets him apart; his career is constantly evolving, incorporating influences from around the world. Wherever his musical journey takes him you can be sure he’ll remain rooted to his Baye Fall beliefs, and no matter what, will always sound like Cheikh Lô. In 2008, Cheikh Lô recorded a song ‘I still haven’t found what I’m looking for’ by the band U2 on the album ‘In the name of love : Africa celebrates U2. Two years later, the singer released his fifth album, ‘Jamm’. An album which is mix of rumba, traditional songs from Senegal and Cuban rhythms.